Usually I don't post two similar views in a row on Flickr, but I think I like this version of Pololu Valley a little better. The light is softer and the water movement and wider composition brings back the memory a little better. So I thought I'd show it here. Some people may like the stormier view of the last one. Feel free to say so! No HDR. See the 1200 pixel version! When I say "good versions", I mean that I will take a shot, look at it and delete it on the spot if I don't like it. I think I took about 12 shots at this exact location and kept 8 for review later. Now I like about 3 of them. Actually, the last one looks better in the back of my camera than it did after I finished processing it. I even repeatedly looked at the back of the camera to try to get it to look the same on my Photoshop screen! This one looks exactly like the back of the camera. That is good enough for me! I kept the default settings for the camera's LCD screen just so you know. Also, after the shot, I often look at the photo and compare it to the scene in front of me, just to get an idea of how well it was captured. Of course, the real scene usually looks better, but not always. A dull scene may look more contrasty and interesting in the back of the camera than to your every own eyes seeing it for real. After all, the camera can not capture the same dynamic range, so it will look more contrasty in the camera. The Big Island has a wide variety of climate zones and geological regions. Lava flows create lots of new land and those areas are rough and new. Areas like this valley are on the older side where the volcanos are extinct and the land is being sculpted into fantastic forms. The almost 14,000-foot (4200m) Mauna Loa and Mauna Kea volcanoes create rain forest upwind and barren deserts downwind. And they can exist just 4 miles apart! 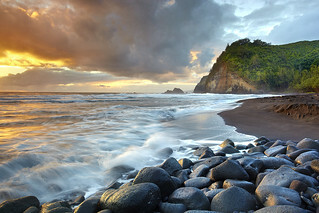 The beaches vary from black sand, to white, golden, red and even green. It is a photographer's paradise, but it is big and you have to do your research to find the best spots. To get here, you must get up well before sunrise (it is not a sunset beach), drive to the tourist pullout and hike down a 400-foot trail in the dark to get here in time for sunrise. It is not a difficult hike but it is slippery and one mistake and your day is ruined! Also, this is a great place to spend the day, far away from civilization. The map shows the exact location. The state Gov. of California website. Have a look! It is Flash with my pics cut into layers for a 3-d slideshow. If you are into building apps, the State has opened up lots of data to the public, so check it out! Simply the best way to scout out locations that there is. You can see sun angles and pre-visualize light under lots of different conditions. Sometimes you can actually pre-compose your shots! This has saved me many thousands of vertical feet of climbing by avoiding spots with blocked views etc. Photos of every inch of the California coastline from a small plane. Excellent for close in detailed views.